Thousands of Hillary Clinton's emails while US secretary of state have been released, including many that have been censored after being deemed classified. Mrs Clinton, who is seeking the Democratic nomination for the 2016 presidential election, has been under fire for using a private computer server for work emails while in office. But she says no classified information was sent or received. However, 125 emails were deemed confidential by the state department. The state department disclosed that Mrs Clinton used a private server during her time as secretary of state (2009-13) after journalists requested copies of her government emails. 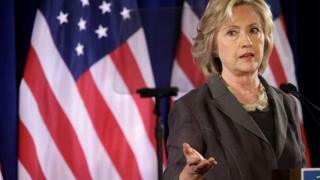 Mrs Clinton's opponents have accused her of putting US security at risk by using an unsecured computer system. The presidential hopeful has admitted that her decision to use a private email server at her New York home was a mistake. The state department released 4,368 emails - totalling 7,121 pages - late on Monday. On Monday, the state department said about 150 of the messages had to be censored because they contained information considered to be classified. On Tuesday, it revised the figure to 125 messages. One of the emails - sent in November 2013 by Mrs Clinton's then foreign policy adviser Jacob Sullivan - was published heavily redacted and marked classified until 2025. Mr Sullivan, who is now a policy adviser for Mrs Clinton's presidential campaign, forwarded her boss the email with the subject line: "No go on Burma (Myanmar) travel." In another email - from September 2010 - Britain's David Miliband admitted that losing the Labour leadership race to Ed Miliband was "tough", adding: "When it's your brother..."
State department spokesman Mark Toner was quoted by AFP as saying the process of re-evaluating the remaining unreleased emails was continuing. The emails were not marked as classified at the time Mrs Clinton sent or received them. The vast majority of the correspondence concerned mundane matters of daily life at workplace, including phone messages and relays of daily schedules. One particular email eliciting laughs among the US political reporter set is an email about Gefilte fish, a traditional Jewish food eaten on the holiday Passover. The Washington Post explains that the Gefilte fish email was about a shipment of the product to Israel from the US Mrs Clinton was trying to save from a high tax. Many of the emails show the influence of Sidney Blumenthal, an outside Clinton adviser. In one email, Mr Blumenthal describes former UK Liberal Democrat leader Nick Clegg as having "misplayed almost every turn" and being full of "inbred arrogance." Associated Press says the emails revealed that Mrs Clinton and her aides were acutely aware of the need to protect sensitive information. It says Mrs Clinton also expressed frustration with the state department's treatment of certain ordinary documents as classified. In one email, a state department IT staffer is trying to determine why Mrs Clinton's non-governmental email is bouncing back. More than a quarter of Mrs Clinton's work emails have now been released, after she provided the state department with 30,000 pages of documents last year. Polls indicate that the email scandal has affected Mrs Clinton's ratings, though she remains the frontrunner for the Democratic nomination. At this point the novelty of peering into Hillary Clinton's email correspondence is starting to wear off for the general public. Although the former secretary of state's attempts to explain why she used of a private email server have damaged her political standing, the steady release of her electronic missives has faded into the background noise of the presidential campaign. There may yet be some scandalous message lurking in the trove of yet-to-be-released messages, but given the fact that the files were screened by Mrs Clinton or her staff, that seems unlikely. Image caption Hillary says she set up the private server for "convenience"
Mrs Clinton says the primary reason she set up her own email was for "convenience" but sceptics say the real reason she did it was because it gave her total control over her correspondence. According to Mrs Clinton, she sent or received 62,320 emails during her time as secretary of state - she says half of them were official and have been turned over to the state department. Probably not. Mrs Clinton's email system existed in a grey area of the law - and one that has been changed several times since she left office. It's a big deal because Mrs Clinton is asking the US public to trust that she is complying with both the "letter and the spirit of the rules". Critics on the left and the right are concerned she made her communications on sensitive national security issues more susceptible to hackers and foreign intelligence services.